One of the most well-known areas of Boston, Harvard Square surrounds the university and square that give the area its name. Harvard Square has become a major intellectual, cultural, and nightlife center. While the area is home to many restaurants, bars, and shops, it also maintains a serene and peaceful atmosphere, thanks to the Charles River, numerous parks, and Harvard's brick-walled campus. Traffic and parking in this hot-spot nabe are among the worst in the city, so most rely on public transit via the Red Line T. Nearby nabes include West Cambridge,Larchwood, Aggasiz-Harvard University, Mid Cambridge, and Riverside. Harvard Square is “burning”. Do not come here with any expectations, because you will always be surprised! The place is always jumping with plenty of shopping, great coffee shops and restaurants and especially nightclub/music venues. You never know when you’re gonna catch a street performer or stop in some of the fashionable shops on Cambridge Street. Some of Boston’s finest and most “indie” clubs are here including Club Passim & The Middle East. With MIT and Harvard around the corner, there’s so much intellectual energy it’s almost overwhelming; but it serves as a terrific place to do work, visit, meet with friends, and even relax. The nabe is very easily accessible on Boston’s Red Line as the T runs right to the middle of the square (as if the T came first in fact) and busses also run all around the area. If you’re looking for a young crowd (perhaps one of the youngest areas of the city), Harvard Sq. is the place to be. Even if you’re part of the older crowd, visit the square to take in the world famous college and sights! The Good: Newbury Comics (old comic book shop turned into cd/dvd/videogame/toy/comic book shop), Tokyo Kid (for fans of Anime), Million Year Picinic (comic book shop), the Coop (Harvard book store), AMC theater (big budget movies), Brattle theater (independent and classic films), Bartley’s Burgers (GREATburgers and shakes), Border Cafe (Great Cajun/Mexican food. Try the Cajun Popcorn), Uno’s, and lots of interesting street performers. The Bad: Constant feeling of guilt because of not being able to give money to the street performers on every corner and the fact that Harvard Square is always very crowded. The Ugly: The homeless people that are also on every street corner asking for money. Overview: Harvard Square has it all: trendy, commercial, good, bad, and ugly. A fun place to visit every now and then. Harvard Square is one of the most eclectic parts of Boston that I know. Yes, located near prestigious “Hahhvard” you get the pretentious, historical feel but with a funky twist. 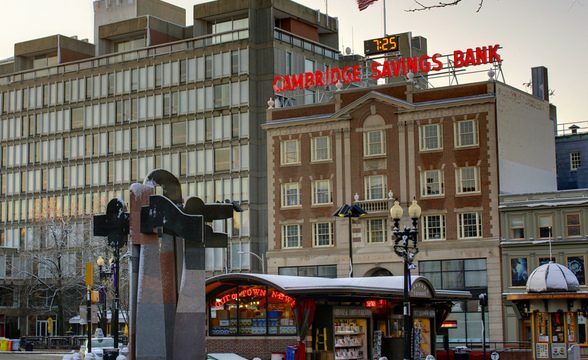 Here you will find something that will accommodate people of all ages from food, shopping, history, art…you name it!There’s a great mix of local shops, big name brands, small boutiques located within Harvard Square. The Garage is a popular stop for the local hipsters, looking to indulge in the latest trends of Hootenanny or just grab a slice at Crazy Dough’s Pizza Co. Down the street you will find the Harvard COOPfilled with students and bookworms. Harvard Square has a few nice coffee shops, Peet’s Coffee is always bustling with caffiene-driven students. If coffee doesn’t tickle your fancy you can always swing by Teavana for exotic teas or The Boston Tea Stop for a delightful cup of bubbletea. I highly recommend the Boston Tea Stop. This is the ultimate college hang out or just a place to relax with a few friends. Inside the pastel painted tea shop, you will find small tables with groups of people playing boardgames, conversing, or reading magazines. It’s a great atmosphere with great food. They have the best bubbletea you will find in Boston along with the most delectable Mochi Ice Cream. It’s to DIE for! Definitely worth hitting up. 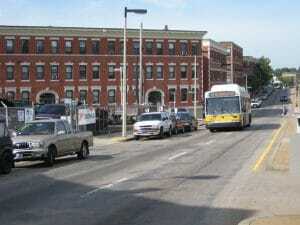 Harvard Square is located in a great location, easy access to public transportation (Red Line, Harvard Square Stop). I do not recommend driving here. Finding parking = headache and a half.Be environmentally friendly, take the T.
Harvard Square’s brick sidewalks sustain a constant flow of people from all around the world and all walks of life, creating a scene that is one of the most vibrant and alive on the East Coast. Watching the ebb and flow of humanity from the outdoor terrace of Au Bon Pain is one of the many cherished pastimes here. Although some lament that the Square has become too mainstream and suburbanized with an increase in chain stores, there are still a number of long-time holdouts and independent stores that have not become casualties of gentrification. The Harvard Bookstore and the nearby Harvard COOP are beloved and well used literary institutions and the perfect place for the intellectual bibliophile, as is the Raven Bookstore on JFK Street which specializes in high quality used books, particularly in the social sciences, and one of the few places where I could, with no effort, find a three-volume set on Iranian history. Adding to the mix, Schoenhof’s Foreign books is that rare gem where you can peruse bookshelves full of French and German literature, Arabic children’s books, and that Persian-English dictionary you’ve always wanted. It’s a great place for language students, homesick international students, and Linguistics majors alike. Harvard University’s campus, the not-so rusty anchor of the neighborhood, needs little introduction. Its redbrick halls and venerable museums keep the crowds of camera-wielding Japanese tourists and aspiring students with their families coming. Even on those unfortunate New England days of bitter rain and wind and puddles of slushy snow, the area remains vibrant. But I always look forward to those beautiful weekends in the Spring when it feels like half of New England has congregated here: the grumpy old chess players, the stressed but optimistic Harvard students, the giddy suburban high school students who flock to the Urban Outfitters, the hipsters, and the eccentric homeless population. All of these disparate groups weave together effortlessly to form the unexpected but appealing mosaic that is Harvard Square. The variety of eating options in Harvard Square is typical of an urban college town. No matter what you’re in the mood for, you’ll find something agreeable and, more importantly, relatively inexpensive and filling. The sweet potato fries at Bartley’s Burgers are legendary, and the super-sized sandwiches at Al’s are always satisfying. There’s good Mexican food at Felipe’s Taqueria, and there are plenty of other ethnic eateries around every corner. Driving a car into or through Harvard Square is not recommended (indeed, rather foolish) as the area is designed with pedestrian and bicycle traffic in mind and is well served by the Red Line of the MBTA subway, which can take visitors right into the center of Boston in about fifteen minutes. Most important bus lines in the area converge in the bus station underneath the Square, which is connected to the Red Line station. It’s easy to get tourist trapped in Harvard Square, and while you should definitely explore the campus and give a dollar or two to street musicians outside the T station, I recommend these places, which are a little more off the tourist beaten path. *Clover Food Lab- local, seasonal and all vegetarian fare. Pretty cheap and quick too. I also gotta give a quick RIP to the landmark Curious George Store and Bob Slate’s stationery, two longtime Harvard Square institutions. All in all, Harvard Square deserves its reputation as a must-see when visiting Boston. It’s fun, busy and has pretty much everything you would want. Living here can be expensive, but you would never really have to leave. Oh, Harvard Square. I’ve spent so many weekend afternoons and evenings there that maybe I’ve just gotten burnt out, because I have to say it’s really more of a “default” hangout. It’s always crawling with Harvard students, a fairly significant amount of homeless and street performers, and a lot — I mean A LOT — of tourists. Prepare for crowded streets and constantly overhearing pretentious intellectual conversation. Great to get to via subway (Red Line) or bus, but don’t try driving; it’s nearly always a mess of aggressive cab drivers on the streets and, no, there is no place to pahk your cah near Hahvahd Yahd. The bookstores are the best I’ve seen anywhere in Boston: there’s the Harvard/MITCoop, the independent Harvard Book Store, Raven Used Books, and Grolier Poetry Bookshop. And you can’t shake a stick without hitting some sort of restaurant: taquerias, burger joints, pubs, cafes, grills, just about everything. The out-of-the-way places are the best, though. Pinocchio’s Pizza is open late, cheap, and delicious. If it’s winter or fall, go to LA Burdick’s and get one of the darkest, richest, dreamiest cups of hot chocolate in the entire world; you will have lustful dreams about this hot chocolate and, even at $4 a cup, count the days and pennies until you can go back. Great to go to once or twice. Easy to get complacent and go there all the time, but after a while the charm wears off. Lazy people beware: if you live here, I imagine you may never go anywhere else. I was an undergrad at Boston University from 2007-2010. Where bustling Comm. 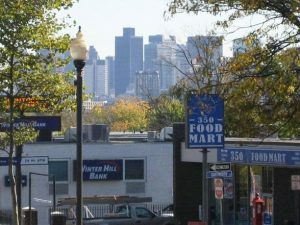 Ave. and the Fenway-to-Allston region of the city were all home-bases for me, it was almost guaranteed that every weekend I would venture out to Harvard Square for some “getaway” time. No, it wasn’t a feeling of wishing I had gone to Harvard…it was a feeling of excitement for a place that had so much to be explored. While I was never too intrigued to traverse the side streets of Allston (which always seemed to be dark even in broad daylight), I was lured into the red-brick-laden alleys of Harvard Square, where light always seemed to find its way in and bounce off the buildings in a seemingly impossible artistic way. In Harvard Square, you never feel alone: people of all types are always walking around. If you like people-watching, this is a great place for you. If it’s a pleasant summer’s eve and you’re yearning for some people-watching (and maybe a meal and a unique summer beverage on the side), take a seat under a yellow umbrella at an outdoor table at Grendel’s Den (Hurry! First come, first serve!). You’ll almost certainly be serenaded by a local musician and you can be sure to see a circulation of students, families, and loiterers (and everyone in between) coming and going through the small quad that lies between Grendel’s Den and JFK St. A special tip: head to Grendel’s between 5-7:30pm or 9-11:30pm and you can get half off your meal if you order $3 or more in drinks per person! If you like piña coladas, or getting caught in the rain (just kidding, but seriously…), head over to the Border Café for some Mexican belly-fillers, multicolored-hot-pepper-twinkle-lights, and some cha-cha-cha! But be sure to get there early or be prepared to wait in line if you’re planning on visiting on a weekend—this place gets packed! If you’re not a big eater, no big deal! There are plenty of other activities in the Harvard Square area. Looking to exercise or get some fresh air? Take a walk or bike along the Charles at sundown and watch the crew and sailing teams effortlessly glide down the River. Just killing time? Head over to Beadworks and make yourself (or a friend!) some jewelry—hours will pass in the endless fun. Or head over to “The Garage” shopping center to get a tattoo or piercing at “Chameleon”, or get a Ben & Jerry’s ice cream cone. If you’re in the mood for a quick flick, stop by the Loews movie theater on Church St. Then take a stroll through Harvard’s campus—act like you go there. People will think you’re really smart…or you’ll just have fun pretending! Getting around in Harvard Square is a piece of cake! Most of the time walking is the best bet (mostly because it’s just a nice area for walking—great brick sidewalks), but there are MBTA stops everywhere. There are bike lanes on many of the main roads, if that suits your fancy, or easily catch a cab pretty much anywhere. If you’re driving in for a visit, there are parking garages and lots all around—just search for the blue “P” signs as you’re entering Harvard Square. The parking prices are reasonable, and many of the lots have agreements with some of the nearby restaurants for parking validation. Whatever you end up doing in Harvard Square, you won’t be disappointed. There are too many shops and restaurants to name and see in a day, and the atmosphere is intoxicating. With its ever-changing and funky fashion, classic architecture, and aesthetic charm, you’ll want to move there. A word to the wise (and this goes for any part of any city), stick to being out by yourself in the daytime—the night-walkers are not always friendly, and you may be setting yourself up for some unpleasant encounters if you’re walking alone late at night with your iPod headphones on. Luckily, though, there are usually plenty of police officers patrolling the area (since it is a college area), so most of the time you’ll feel very safe. Many people think of Harvard Square as a tourist trap, and in many ways, it is, but it also has some great locals since it is, after all, a college town. In fact, it really is the perfect combination of touristy places and little hidden local favorites. I think the tourist traps distract visitors enough so they don’t go bothering and ruining the local spots. In other words, the college kids really rule the roost in Harvard Square. This nabe really has it all, though. Culture, food, shopping…and all of it is really, really good! The local Harvard museums are some of the best in Boston. They’re small and manageable and house some of the best art in the city. The food is diverse, cheap, delicious and always open. Want a falafell? How about amazingly spicy Thai or Indian food? Or a burger? Are you a vegggie or a vegan? No problem! The shopping isn’t anything to shake a stick at either. Yes, there is the ubiquitous college town Urban Outfitters but then there are small boutiques that have everything from unique fashions to quirky little fun toys. Residents are mostly students living in dorms however there are more residential nabes and apartment buildings in nabes in the vicinity-many within walking distance of Harvard Square. For visitors and Boston residents alike, Harvard Square is a lovely place to visit. It’s really easy to get to on the bus and the T, but it’s also a great walking nabe! I’ve lived in Harvard Square for two and a half years and, honestly, I love it. More than anything else, I love it because Harvard Square is alive. And, like all great neighborhoods, its unique, refreshing beauty charms residents and visitors alike. So much of Harvard Square’s life centers on the campus of its namesake, Harvard University. Competing tour groups vie for your business and want to show you around Harvard Yard. The guides are informative, bright, and often very funny. For an enjoyable, family-friendly tour, go with the Harvard-sanctioned Crimson Key Society. Famous(ish?) for their hilarious take on the film Love Story, they also serve as lively and interesting guides of the ivy covered campus. They will regale you with tales of lies on the John Harvard statue and why certain former Harvard Presidents don’t have houses named after them. For a slightly edgier tour, go with the unofficial Hahvahd Tour. The guides will take you on a similar trip as Crimson Key, but their takes on some things – like the John Harvard statue – are just a little more . . . interesting. If you don’t feel like taking a tour (let’s face it, you probably don’t) but want to get your learn on, take in one of Harvard Square’s excellent museums. The Fogg Art Museum is currently closed for renovations, but just across the street is the Arthur M. Sackler Museum which houses three levels of masterpieces . While many of the Western exhibits are rotating, the Sackler Museum always features an outstanding collection of art from the Middle East, India, and the Far East. If art isn’t your thing, Harvard’s Museum of Natural History is just as fascinating, with exceptional exhibits on mammals, birds, insects, flowers, minerals, climate, dinosaurs and their fossils, all of which will be very popular with small kids. Harvard Square isn’t all museums and tours, though. For the shopper in you, the area has an eclectic blend of clothing stores, from higher priced boutiques like The Tannery, J. Press, and Passport to the more moderately priced Ann Taylor and The Gap. Foodies will enjoy Cardullo’s Market and its fine array of cheeses, wines, pesto, and an assortment of other high quality small bites from around Europe. One of Harvard Square’s true jewels is the Harvard Book Store, an excellent independent shop with a knowledgeable staff and a top-notch literary inventory, including a great collection of lesser known works from well known masters like Gabriel Garcia Marquez, Leo Tolstoy, J.M. Coetzee. Wander around for a few minutes and you’re bound to stumble on something inspired. Of course, Harvard Square also features awesome restaurants, bars, and nightlife. While there are several good pizzerias, the local highlight is easily Pinocchio’s (or Noch’s) delicious, fresh Sicilian-style pizza at a good price, in a quaint, no-frills shop. For one of the very best burgers in Boston, hit up Mr. Bartley’s Burger Cottage where they’ll serve you thick, juicy burgers with any number of variations. The only downsides are that the lines tend to be long and you will smell like a burger joint when you leave. However, the intense flavors are well worth those small inconveniences. For more traditional (and more expensive) sit-down restaurants, Upstairs on the Square offers excellent food in its casual Monday Club Bar downstairs and in its more formal Soiree Room upstairs. The Monday Club Bar is also a great place to stop in for a glass of wine, cocktail, or dessert at the end of a night. In the Charles Hotel, Legal Sea Foods is the pinnacle of fresh fish, and Rialto offers exquisite regional Italian cuisine. After dinner, head downstairs at the Russell House Tavern for their phenomenal unique cocktails. I’d recommend one, but it’s more fun to try several (oh, and they have one dollar oysters after eleven o’clock). In the warmer months, enjoy drinks with friends and a soft summer breeze on the roof deck at Daedalus. If you want to drink and dance, Redline has a relaxed atmosphere and the DJs tend to play a good mix of tunes. To boot, the food is okay and it’s a good spot to grab a beer with your friends and watch the game earlier in the night. For a slightly edgier and drunker crowd, try the second and third floors of the Hong Kong, but be forewarned: DO NOT GET IN A FIGHT THERE. I’ve watched it happen and, trust me – the guy who gets into fights at the Kong is probably tougher than you are. After a long day of museums, shopping, book stores, dinner, dessert, dancing, and avoiding fights at the Kong, I have no tips for you on where to stay if you don’t live in the Square. I live here and have never stayed in the hotels. For what it’s worth, they all seem nice enough. If grandma comes to visit you the next morning, don’t take her to Upstairs on the Square for brunch. The food will be great, but grandmas always insist on paying and you won’t want to stick her with that bill. Take her to Crema Cafe. The sandwiches, frittatas, and coffee are very good. Bibliophiles, rejoice! Exactly what you might expect to find in the home of one of the most respected universities in the world, there are a plethora of bookstores to find anything that piques your interest. Literary fiction to airport pulp, textbooks to comics, poetry to foreign books, something worth reading is most definitely in or around Harvard Square. After you pick up your new (used?) book, stop by one of the many great cafés or tea shops for an afternoon full of caffeine and mind expansion. If instead you’re looking for something on the materialistic side of mind, you will not be disappointed – stores, stores, galore. All of your clothing needs can be satisfied here, so long as you’re not expecting to find something from an independent boutique. From what I’ve gathered, the small stores disappeared from this square years ago, to be replaced by the not-quite-as-well-known corporate ones (and some of the well known ones). By far the best aspect of the square that anybody will agree upon is the endless number of restaurants and bars to visit. There is nothing you can’t get here – burgers, pizza, falafels, Mexican, Asian, Italian, anything from quick and easy to fine dining. Harvard Square really does just have it all. No matter what your mood or your disposition, there is something here for everyone. A word of advice, though – avoid driving, as you’ll save yourself a headache and some time. There is a Red Line T-stop in the heart of the square, and you can get to anywhere in Boston in no time flat from here. Perhaps nowhere else can you have a discussion about the IMF and structural readjustment politics with a homeless man. Harvard Square is a diverse neighborhood in class, ethnicity, and education and the energy of the constantly buzzing square is testament to that. Of course there are the must-see’s—the University and it’s beautiful campus and museums that are open to the public, the many book stores that line the streets (Raven Used Books and the Harvard Book Store being particularly excellent locations), and the theaters. Harvard Square has both an intellectual and a youthful side offering both highbrow shopping and dining as well as hipster-chic and quirky offerings like Black Ink, a novelty shop offering everything from scented erasers to bizarre Japanese design products, and Sweet, a charming (and highly trafficked) bakery selling adorable tiny cupcakes. Aside from dining, shopping, and growing your brain a little, Harvard Square is a great place to be broke, quite frankly. Some of the best performers and street musicians gather here; there is always a nice bench, a tree, and a guy playing guitar so you can relax, listen, and spend the afternoon people-watching. It’s 11:15am. I hop the 96 bus into Harvard Square. Three hours later I return with a belly full of rich, homemade hot chocolate, printed stationary and… a nose piercing. Ditto on the bus ride. I stride purposefully into Mint Julep, stride back out empty-handed after looking longingly at whimsical dresses and colorful scarves (lovely place for window-shopping but packs a wallop on the student wallet). I go instead to Urban Outfitters, descend into the basement and the shopping gods smile as I score silver earrings, a skirt, and a floral pair of canvas sneakers for $25. A group of friends and I clamber onto the now famous 96 and ride into the night. A rooftop dinner at Daedalus fuels a dancing spree at Hongkong before we contentedly surrender ourselves to a cab that carries us home. My favorite Harvard Square Purchases: aforementioned nose ring, a mirror from Bali purchased at a Christmas bazaar, a guidebook to the Dominican Republic. Accessible by bus and the Red Line, this Cambridge nabe can be a bit pricey and (as other reviewers have mentioned) does have a homeless presence but I hope my own wonderful memories have convinced you to pay it a visit. Harvard Square is ironic in a sense: while it teems with students and upper class Cambridge residents, there is certainly a homeless population. Nonetheless, Harvard Square has tons to offer: from your necessities of Bank of America or CVS some of the best restaurants, bookstores (the Harvard COOP), boutiques, and bars in Boston live here as well. Notable dinners are not to be missed at Upstairs on the Square, Small Plates, or Ohm Resturaunt, serving American Contemporary, International Fusion, and Pan Asian cuisines respectively. Crema Cafe, a hot spot for the academic and trendy coffee-goer, houses an interior of high ceilings, calm neutral walls, and diverse people. For walks and sporting activities, the Charles River extends miles long of footpath territory for your leisure. Harvard University also has venues within its brick gates such as the Harvard Museum of Natural History, campus tours, and the Harvard Library: all open to the public for visiting. To live, Harvard Square I imagine is full of your necessities, entertainment, and abuzz with people. This nabe is for the those who like well-lived sidewalks, beautiful back streets with historic homes, away from Downtown Boston but not too far! I have a few issues with Harvard Square. First, there is constant construction. Every time I go there they are either tearing up the road or repaving. The roads are very narrow and people drive fast, so unless you know what you are doing I suggest you park outside of the center. Second, parking is ridiculous. Forget about finding a spot on the street, which is near impossible. The lots are also very expensive. I’ve paid $40 before! It’s best to park outside of the city and take the red line in. Third, don’t go when the University is in session. The students I’ve had the pleasure of meeting are rude, hipster to a fault, and feel entitled. This is only my opinion though. Henrietta’s Table is probably the best restaurant there. It is located in the Charles Hotel and parking can be validated if you park at the hotel. Their motto is “honest to goodness New England cooking” and I couldn’t agree more. They buy from local vendors and regularly partake in community events like The Farmer’s Market (Sun 10a-3p, Fri 12p-6p now through Nov.). Harvard Sq. is a nice break from downtown Boston and is most enjoyable in the warmer months! At the center of Harvard Square, the “Out of Town News” newsstand symbolizes the self-proclaimed historical and intellectual significance which permeates the square. Here locals, students, professionals and tourists (lots of tourists) intermingle in the density of excellent shopping, dining and entertainment. While tourism means large crowds and frequent high prices, the convenience and shopping available in the area comes as a pay off, and if you can avoid every Au Bon Pain you see, you will discover a variety of excellent cafes where you can spend an afternoon or lunch hour. The dining options are exceptional and plentiful, particularly if you enjoy ethnic foods. Beyond the shopping and tourist attractions, Harvard Square caters some of the best art and entertainment buoyed by ocal college communities. The Brattle Theathre regularly screens classic and cult favorite films and street performers populate the sidewalks (singer Tracy Chapman frequently played in the square as a Tufts student). The proximity of art schools and institutions make it an area dense in ideas and expressions, and SQUAWK Coffeehouse open mike nights promise some interesting and engaging talent. Harvard Square is an excellent place for tourists to shop and grab a great meal. It is easily accessible from the Red Line and has decent parking. And for those interested an intellectual and artistic community resides around the corner from some of the more visited institutions. A Harvard student walks straight past a one-man band, two hipsters, a couple on a date, and a homeless guy debating Obama’s healthcare plan with a street performer – and straight into a bar. No, this is not the start of the joke and, no I am not nearly clever enough to think of the end of that joke (though the Harvard student might be). It is however, a perfectly typical thing one might encounter on the streets of Harvard Square. Harvard Square is a mash-up of every contradiction you might think up. It is all at once down-to-earth and pretentious, blue collar and upper class, gourmet restaurants and fast food, and trendy and dirty. It is, hands down, one of the best places to ‘people watch’ in Boston. Located in scenic Cambridge, Harvard Square is a fantastic melange of things that one would expect to see in the craziness of Faneuil Hall or Quincy Market and the scenic, quiet, and very well manicured lawns of Harvard Campus. Catering to the eccentrics and conservatives of every kind are a host of clothing, book, accessory, food, and other miscellaneous stores ranging from the hip, organic, trendy, and expensive to the cheap and quirky. For the gourmand and the beer connoisseur, the choices are just as varied. On a nice day, Harvard Square is a great place to spend several hours walking in and out of the stores and observing the surroundings. At night, there are a number of bars and even a great comedy club located in the attic of a Chinese restaurant. With those exceptions, however, things tend to quiet down at night. The area is centered around the Harvard Square T Station, making public transportation a breeze. Commuting by car, conversely, is not at all recommended as you are more than likely to encounter traffic and less than likely to encounter parking spots. Harvard Square is a unique part of Boston and one of a kind. 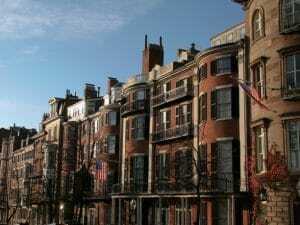 As there are many neighborhoods across Boston that have a sole demographic, (North End: Italians eateries) Harvard Sq. is an extremely eclectic area with your traditional Ivy Leaguers, Hipsters, high schoolers, and all of the above. It really is a place for everyone though as there is a great mix of shops, theaters, bars, and dining. The dining options are awesomely varied and tasty, from local classics like Mr. Bartley’s Burgers to established chains like Bertucci’s and Chipotle, Harvad Sq. has it all. If your not looking to eat but want to go out for drinks there is a wide variety here too. From the classier Irish pub in Tommy Doyle’s to it’s under-achieving Irish dive bar around the corner Whitney’s, Harvard Square has options for all drinkers. Late-night options too with Ihop and the 24 hr market. On a nice sunny weeknight or weekend you can count on Harvard Square being packed with people in the streets, buskers about, and the bar patios filled. It is a fun place to be whether you are going out for dinner and drinks or just going for a stroll to get some good people watching in. Transportation is relatively easy as there is the Harvard square T stop (Red Line) and multiple bus routes that run through the square. However, driving is a different story. Parking is horrible and with all the one ways you can end up doing circles around the square for 10 minutes before settling on a spot 10 minutes away from where you want to be. Hop off the T at Harvard Square and you’ll find droves of tourists, students, hipsters, professionals and even some street performers. While some criticize Harvard Square for straying too far from the neighborhood shopping center it once was, many have embraced it for its mix of funky upscale boutiques and chain stores, and its many restaurant options. This nabe is often busy, has a great, bustling, energy, and is easily accessible by the red line. One of my favorite things to do in Harvard Square is browse the Harvard Coop Bookstore. I’m not sure if it’s the affiliation with the school, or the close proximity to so many books, but just being there makes me feel brainy. Another unique store to check out is the Curious George & Friends toy store across the street. I mean, they have a whole section devoted to Curious George. What’s not to love? You can also find stores like Urban Outfitters, the GAP, and Newbury Comics here, not to mention Hunt’s Photo & Video, Staples, a Loew’s movie theater, really everything you need. As far as restaurants are concerned, try Cambridge 1 for the flattest pizza you’ve ever eaten in your life. Rent in this nabe is a wee bit expensive. More so than other Cambridge locations, likeCentral Square. However, it’s a nice place to live if you can afford it. No hard feelings from me! Even if Harvard rejected my college application, I love going to Harvard Square. I’m getting hungry thinking about it, and that’s not just because I haven’t eaten breakfast yet. There is a LOT of food in the Harvard Square area, including one place with the best burger I have ever had in my life (Mr. Bartley’s). If you walk around you’ll be able to find many different kinds of food, from American to Japanese, and there’s even a place to get bubble tea if that’s what you’re looking for. If you’re a Harvard prospect, a Harvard tourist, or a Harvard wannabe (like me), there are plenty of places where you can find souvenirs, so you can take a part of the “big H” back home with you. As can be expected, the outskirts of Harvard square aren’t as lively as the heart of the area, but the actual Harvard campus is pretty nice itself. The T can bring you right into the midst of Harvard square, so if you’re not too keen on driving into the messy roads of Boston, hop right on to the red line, and you’ll be there in no time. Good stuff!